Destruction of condyle of mandible is an extremely rare complication of malignant otitis externa. Usually this condition requires external drainage. The alternative may be a radical mastoidectomy and drainage of the joint through the external auditory canal thereby avoiding an external incision. A 60-year-old male patient, presented to us with complaints of discharge fromthe left ear of 7 months duration which was foul smelling and occasionally blood stained. He also had associated dull aching pain in left ear with swelling in the left preauricular region of 3 months duration. He was a known diabetic, hypertensive with ischemic heart disease and was on treatment for the past 6 years. On examination of the left ear there was edema of external auditory canal with purulent discharge and granulations on the floor and anterior wall with diffuse swelling over the preauricular region extending up to the zygomatic arch. There was tenderness over the left temporomandibular joint with no restriction of joint movements. There was no mastoid tenderness, neck rigidity or signs of raised intracranial tension. Cranial nerves examination revealed House Brackmans grade 2 paresis of left facial nerve. Hematological investigations revealed raised ESR and high blood sugars. Pus culture grew Pseudomonas aeuroginosa, sensitive to gentamycin, ceftazidime, ciprofloxacin, and piperacillin. X-ray mastoid showed destruction of the mandibular condyle on the left [Figure 1]. 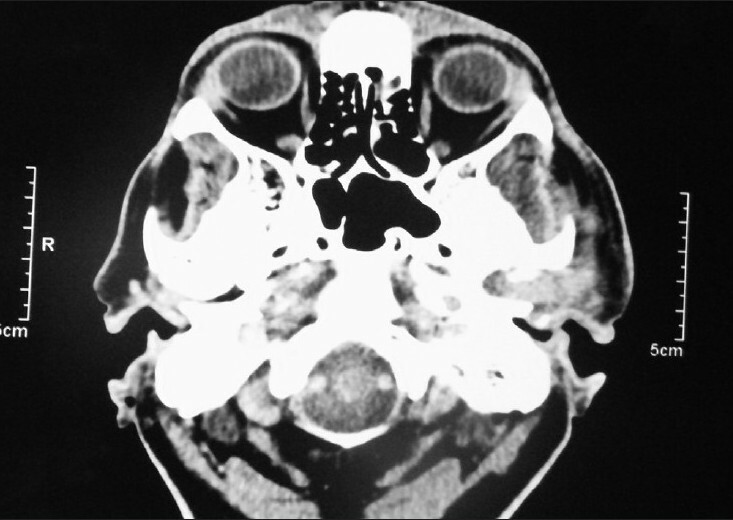 Computed tomography of the temporal bone [Figure 2] showed left mastoiditis with destruction of the mandibular condyle with infra temporal cellulitis and no intracranial extension. Pure tone audiogram showed a severe mixed hearing loss in the right ear and profound hearing loss in the left ear. Patient was treated with intravenous ciprofloxacin for 10 days and blood sugar was controlled with insulin. In view of no clinical improvement he was taken up for surgery. Intraoperatively there was edema of the external auditory canal; a granulation polyp arising from the anterior canal wall with a dehiscence in the anterior canal wall communicating with the temporomandibular joint. 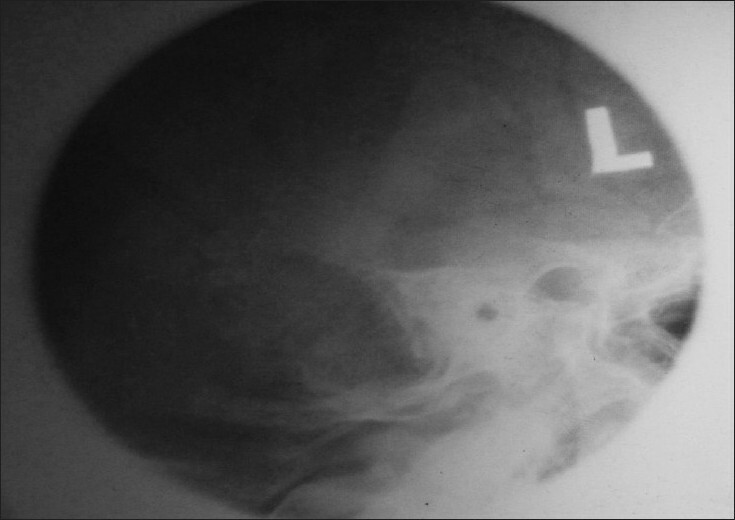 The tympanic membrane was retracted and the mastoid antrum was filled with granulations and pus. The long process of incus was necrosed and stapes suprastructure was absent. Oval window was dehiscent. Patient underwent radicalmastoidectomy with drainage of temporomandibular joint through anterior canal wall. Patient was followed up at regular intervals and the mastoid cavity healed well with improvement of facial paresis and preauricular swelling. Computed tomography was repeated after one year which showed sclerotic changes in the left temporomandibular joint with no evidence of inflammation in the mastoid [Figure 3]. 1. 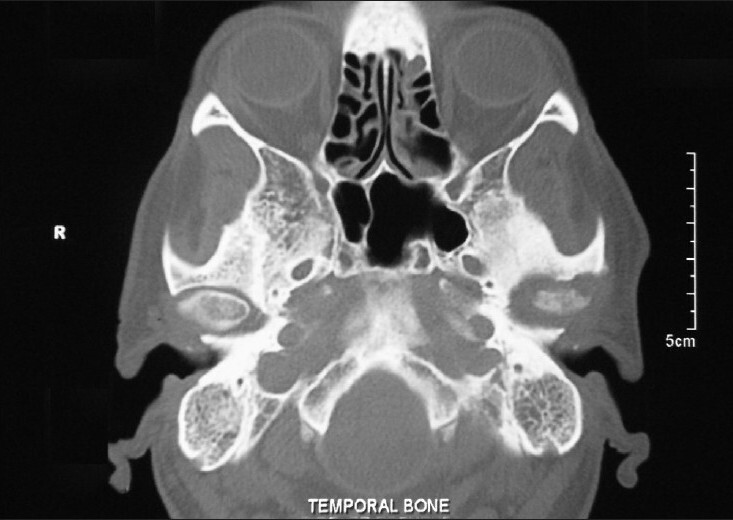 Persistence of granulation tissue in the external auditory canal, 2. Development of cranial neuropathies during treatment, 3. Other signs or symptoms of active infection for more than two weeks after institution of therapy. Any one of these criteria was considered an indication for more radical surgical intervention like a subtotal temporal bone resection to gain access to the primary focus of infection and provide adequate drainage. Midwinter et al. described two cases of osteomyelitis of the temporomandibular joint in patients with malignant otitis externa which was treated by external drainage. Our patient was treated with radical mastoidectomy and drainage of the joint through the external auditory canal and an external incision was avoided. The author would like to acknowledge Dr. SMCSI Medical College, Karakonam, Trivandrum, Kerala, India. 1. Timon CI, O'Dwyer T. Diagnosis complications and treatment of malignant otitis externa. Ir Med J 1989;82:30-1. 2. Cohen D, Fredman P. The diagnostic criteria of malignant external otitis. J Laryngol Otol 1987;101:216-21. 3. Smith PG, Lucente FE. Topic. In: Cummings CW, editor. Text book of Otolaryngology Head and Neck Surgery. 3 th ed. Toronto: Elsevier Mosby; 1986. p. 2899. 4. Mardinger O, Rosen D, Minkow Z, Ophir D, Hirshberg A. Temporomandibular joint involvement in malignant external otitis. Oral Surg Oral Med Oral Pathol Oral Radiol Endod 2003;96:398-403. 5. Raines JM, Schindler RA. The surgical management of recalcitrant malignant external otitis. Laryngoscope 1980;90:369-78. 6. Midwinter KI, Gill KS, Spencer JA, Fracer JD. Osteomyelitis of the temporomandibular joint in patients with malignant otitis externa. J Laryngol Otol 1999;113:451-53.